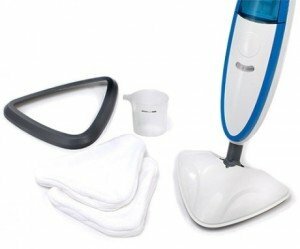 Vax Steam Mop Reviews: How good is the S2? We like: Simple to use. Great price. Easy to store. Not so good: Fairly basic. Can be slightly cumbersome in use. Our verdict: A great “no frills” steam mop for the price. Just make sure you do not pay full price as big discounts are available! Steam mops are a great way to leave your floors hygienically clean without the use of chemical chemicals. The problem when chosing a steam mop is that its easy to get carried away with all those extra features and before long the price can increase significantly. However you can still get a good steam mop from a trusted brand for a very reasonable price and out of all the steam mops and cleaners we have reviewed this is still one of our favourite “no nonsense”, well priced models. So why do we like it so much? Find out in our Vax S2 review. The Vax S2 (or Hard Floor Master as its also called) has a retail price of around £80. Don’t pay this though as discounted prices are usually around £40! 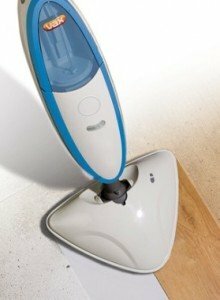 The S2 consists of a Vax steam mop, 2 microfibre cleaning pads, a carpet glider and a measuring jug (which ensures you get the right amount of water in the tank). The S2 Steam Mop will clean any sealed hard floor so it can be used on most laminate, wood, vinyl and tiled floors. As a bonus the S2 will also clean bathroom and kitchen. If you do decide to go for the Vax S2 steam mop we would recommend you buy the longer haired cleaning pads as an extra (RRP £11.50 for 3) as we feel that they work more efficiently at cutting through grime. Once the water tank on the S2 is filled (tank capacity is 0.5 litres) the steam mop heats up in a under 60 seconds and then you are ready to clean. A full tank of water will give you around 10 minutes of steam and the 6 meter cord allows you to move around your home without unnecessary plugging and unplugging. Once cleaned with the steam mop the floors dry almost immediately so no worrying about wet floors or slipping. 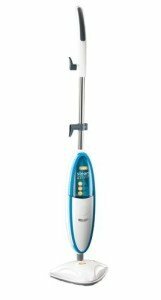 The S2 steam mop is quite slim so will store reasonably easy when not in use. There are, like most things some downsides. For instance even though it is lightweight coming in at only 2.9kg the Vax S2 Hard Floor Master steam mop can be quite cumbersome so anyone with a mobility problem may find it tricky to manoeuvre. There is also no separate attachment to clean grills, BBQ’s and upholstery which some of the more expensive steam mops/cleaners include. On the plus side though it uses tap water rather than the ionised water (as a lot of other steam cleaners on the market require) so this make it more of a hassle free purchase.